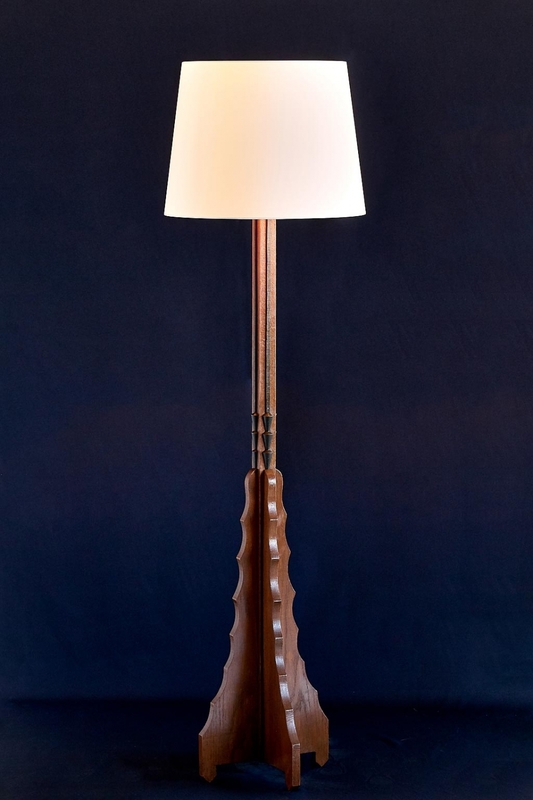 This striking floor lamp was produced in The Netherlands in the early 1930s. The frame in solid and stained oak is defined by the tiered base with an intricately carved pattern. Each side of the middle part of the lamp foot is accentuated by a decorative slat ending in a scalloped ornament, all in a dark stained oak. The new ivory shade has been made according to the original dimensions and offers a nice contrast with the warm color and grain of the wood. The shape, material and craftsmanship of the lamp are exemplary of the Amsterdam School movement. Originating in the Dutch capital in the 1920s, this unique style is rooted in expressionist architecture and borrows certain elements from the Jugendstil (Art Nouveau) and Art Deco aesthetics. Condition: Good. Wiring has been checked and the lamp is fully-functioning.